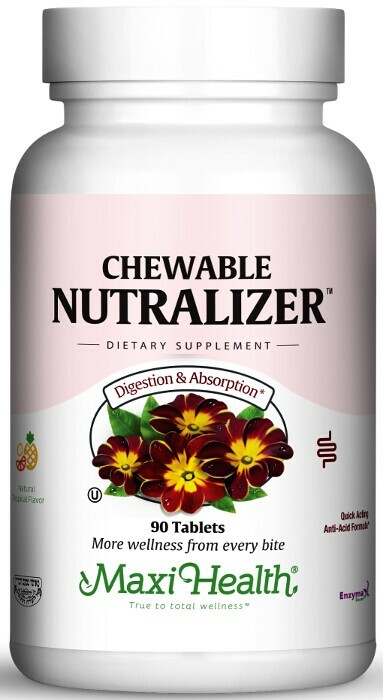 Nutralizer™, a digestive formula, is our unique combination of calcium, inositol, licorice and slippery elm bark. Chew two (2) to four (4) tablets daily, or as directed. Maltodextrin, mannitol, natural tropical flavor, vegetable stearine, natural color, magnesium stearate, Enzymax® (calcium carbonate, bromelain, papain, lipase, amylase, protease, silica), apple pectin, sucralose, Cape aloe. This product contains no animal products, milk, wheat, yeast, gluten, salt, artificial flavors, colorings or preservatives.